The beautiful necropolis was built by the Saadian Sultan Ahmed el Mansour in the late 16th century as a final resting place for he and his successors. The tombs were discovered in 1917 and carefully restored to their former splendour. 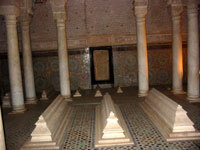 There are 66 indoor tombs, lavishly decorated with colourful, intricate mosaics. The central mausoleum, the Hall of the Twelve Columns, is exceptionally ornate with a high, vaulted roof, furnished with stunning carved cedar panels and columns of grey Italian marble. The tombs are spread through three rooms and there are gardens outside the building where the graves of soldiers and servants can be seen. The Saadian Tombs are a remarkable tourist attraction but they don't require much time and can be fully appreciated in under an hour. The tombs are a stop on many sightseeing tours. Photographs are permitted inside the building, which is fantastic because the minute details and mosaics are the highlight. Address: Rue de la Kasbah near the city walls in the old city. Opening times: 9am-4pm, every day. Admission: About MAD 10 is charged for entry.